We had a total of 152 players in the $1,500 No-Limit Hold 'em Deep Stack event at the 2012 Foxwoods Poker Classic. The final 18 players will finish in the money. We had a total of 176 players in the $300 No-Limit Hold 'em Ladies event at the 2012 Foxwoods Poker Classic. Congratulations to Connie Rinaldi, winner of the $300 Bounty Event at the 2012 Foxwoods Poker Classic. She takes home $12,326 as well as the Foxwoods Poker Classic Trophy and watch! 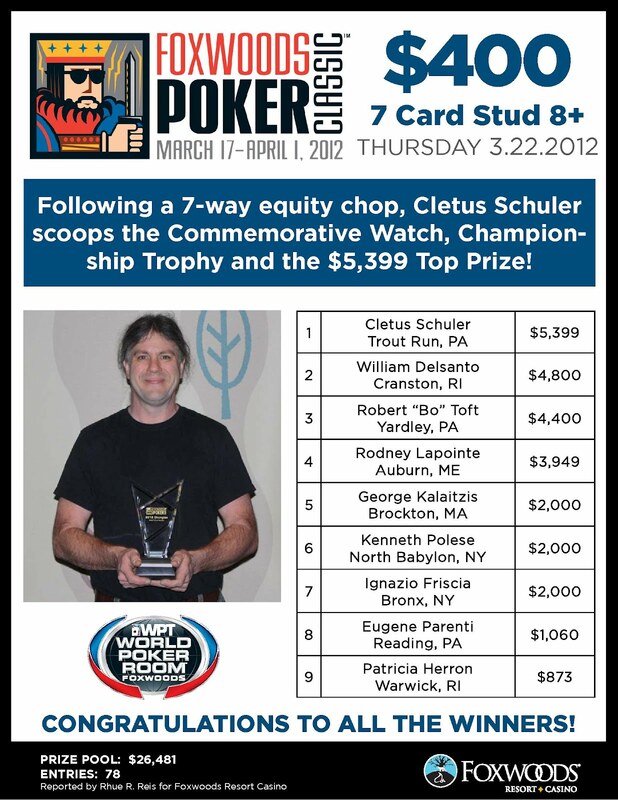 Kloc has top pair with a flush draw and Rinaldi holds middle pair with a better flush draw. The turn comes the [Qc], giving Rinaldi two pair and the river is the [Jc]. Rinaldi takes the pot, eliminating Kloc in 2nd place for $7,242. 33,800 on break. Going to 100/200.Approx 140 runners. Just got set up last hand AA to KK for 60k pot 1 1/2 into play!! I'm left with 6k not out, let's see what I can do! On a board of [7h][7s][3h], Connie Rinaldi bets 30,000 and Thomas Renault raises to 100,000. Rinaldi calls and the turn is the [Kc]. Renault has command of the hand and only has to dodge a deuce on the river. However, the [2s] falls and Rinaldi takes the huge pot with a full house. Thomas Renault is eliminated in 3rd place for $4,673. The river comes the [9c] and Kloc wins the pot with his pair of tens. Paul Darden is eliminated in 4th place for $3,750. Giaccone Nicholas has been eliminated when his [As][Jc] could not improve against Paul Darden's [Ac][Qh] on a board of [Ad][Kd][8s][6s][7d]. On the next hand, James Dyson was knocked out when his [Kc][Jc] was not able to improve against the [Qh][Qs] of Darden on a board of [Ad][Ah][5s][7h][Ts]. The board runs out [6h][3h][3s][2s][Kh] and Kloc spikes a king on the river to win the pot and eliminate Bender in 7th place for $1,952. Neal Dougherty gets all-in before the flop with [Kd][9d] but runs into the [Kc][Qs] of Connie Rinaldi. The board runs out [Kh][7h][6h][3s][2c] and Dougherty is eliminated in 8th place for $1,592. The $1,500 Deep Stack event is now underway at the 2012 Foxwoods Poker Classic. Players start with 30,000 in chips and the levels are 50 minutes in length. The board runs out [Td][7d][2s][8d][5h] and Rinaldi wins both the main and side pots with a set of tens. 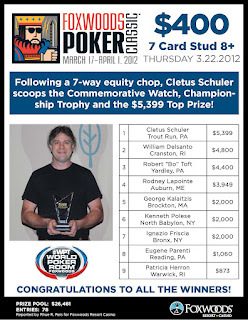 Paparazzo is officially eliminated in 10th place for $975 while Fifield takes 9th place for $1,348. The final table of the $300 Bounty event is about to get underway.